Vintage or precious pen lovers, how do you carry your fine aged or precious pens for everyday use? Despite surviving decades if not centuries, vintage pen material (urushi, hard rubber, celluloid, etc) is not like lucite bulletproof. I have a cloth pen case and a tougher leather one but don't trust soft material. Short of carrying in a box, most often a Parker Duofold snap clam plastic coffin or padded mailer, what do you use to carry? 2 points off if you reply, "Just hang off the back pants pocket"
EDC: Post WWII green binde Pelikan 100N CI 14K BB, post WWII black binde 100N 14K EEF. INKED: early 70s LAMY 2000 MK, Parker 51 Aerometric F & M, rOtring Art Pen 1.1 & 1.5 mm CI & Woodshed Pen Co. Red swirl 1.1 mm CI... Inks: Pelikan 4001 BB & Turquoise, vintage Parker Quink & Lamy Turquoise. Also, my own mixes. Desk pen: Black Pelikan 500NN with a 14K OF-nib in a bakelite Pelikan pen holder. Visconti Dreamtouch 2 and 3 pen cases with zip closures, and a Recife leather 2 pen cigar-style case. The Recife does not fit some of the pens. Usually it is the Visconti 2 pen. Anyone owning three or more working pens is in no position to disparage choices by others. The only "Edc" case I've got. The Pilot x Somes 3 pen case. Isn't vintage or precious, but it does its job. If I only need a couple of pens, I have a 2 pen leather sleeve that Parker sent me as a sop a few years ago. If I need to carry more, I have a a small leather zipper case with elastic bands, which I got a few years ago from Toys from the Attic at a pen show, but which they no longer seem to sell. I also have a crocheted 7 pen roll which FPN member Helen350 sent me a few years ago in a swap. (It has the advantage of being cushiony soft). If I need to carry a lot of pens, I have a 12 pen leather zipper case (I think it's stamped Giroligio) which I picked up at the Toys from the Attic booth last year at the Baltimore-Washington Pen show. Like the smaller zipper case, it has elastic bands to hold the pens in place. But honestly, this morning I had a Pelikan M405 (one of my two most expensive pens) and another pen in that Parker 2 pen sleeve.... If I was paranoid about damaging a pen, they wouldn't leave the house; but more likely, I wouldn't own one in the first place (Thursday, at my writing class, I brought the following pens with me -- in that Parker sleeve: that same Pelikan M405, the Parker Vacumatic Green Shadow Wave Speedline filler, and my Pilot Decimo. The only pen I own that doesn't leave the house is a Morrison gold filled overlay ring top, and that's more because it has a bad habit of unscrewing itself from cap when I'm wearing it on the lanyard I made for it (and don't always have a shirt with a pocket to stick it in for protection agains that happening...). Shirt pocket here, too., one screw cap and one snap-on. Sometimes I'd take a 3rd and the pocket would be crowded due to also having cheaters in a soft sleeve so I recently started carrying a 3-slot clamshell case in my bag. Depends on the day.Typically I have two in a shirt pocket, but I sometimes have as many as 8-10 pens at work. Then I have them in either a pen roll or a 12 pen Girologio case depending on what I have. When I was using my Pilot 'Hannya Shingyo' as my EDC, for a couple of weeks, back when I was working in an office I just carried it in my shirt pocket or the inside breast pocket on my jacket. It was (and still is) one of my favourite pens, and probably my single most expensive pen, but if I was going to ink it up and even take it out of the house for use, then I certainly wasn't going to handle it with kid gloves. Do have enough pen cases, vintage hard, and soft....modern also. 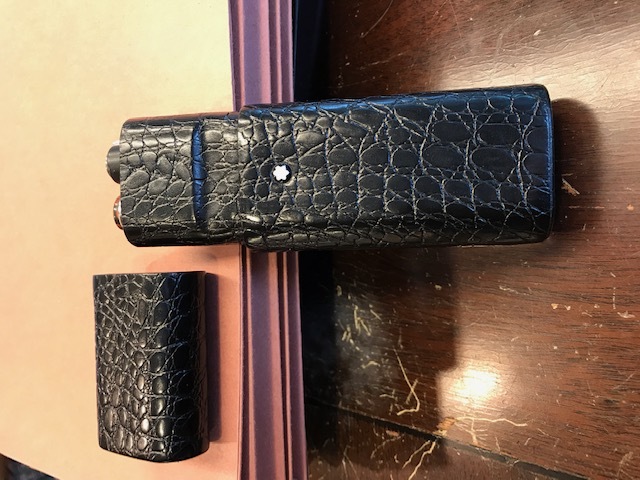 My first one was a stiff leather cigar case...worked fine....then pen cases sort of popped up out of nowhere, until I have some eight of them. Most of my suit coats have a pen pocket. Being retired means I don't need two pens, so don't need a pen case. Which I wouldn't know how to carry to start with. A pen case could fall out of my shirt pocket. I don't put pens in pants pockets...on the other side of my jacket from my wallet I guess. Could carry a pen case with a jacket....but being retired would only use the pen pocket, for an extra pen....main carry shirt pocket. I generally rely on just being careful, but when I want extra protection I use this MB case I picked up a couple of decades ago. I have a 12-pen zippered case that I used to tote around full of inked pens, but I don't carry that many anymore. These days, I carry 3-4 pens and just put them in the pen pockets in my backpack. When I'm at the office, they're lying on the desk next to a notebook. Sorry, no vintage pens here, but thought I should offer my two cents anyway. A cigar case works. Many are quite rigid and crush proof. Marshalls and TJ Maxx had them years ago, flap top with dividers that we converted into pen cases. I hang mine round my delicate neck on a black grosgrain ribbon. Thank you for all the carry options, everyone. It's been so cold in the winter that I've been wearing sweaters and fleece at our no-dress policy office. Today we got a break and temps climbed up a bit so I went formal and wore a genuine pocketed shirt. Now I have an excuse to look decent instead of the usual cube shlubby. Though I still wouldn't trust 100+ Waterman rusty clip-cap secured to pocket and instead will take up a new hobby: Cigars! Just kiddin' I'll start searching for those hard cigar cases. Individual (i have both soft and hard leather individual pen cases). Double (one of those where each of the two are kept separate of the other. Oh, and two leather smartphone cases of the pocket kind I found cheap on a sale. Here they are all banging against each other so I use them for the briefcase where they'll not be too loose. You can find cigar boxes shaped to keep cigars separate that will work as well for pens. Ah! I forgot: I also have a couple of lens cases (you know, for reading lenses) that are slim enough, metallic for endurance, soft lined on the inside, and where I can safely carry two or three pens as well as a microfibre cloth to protect/clean/polish them and -occasionally- I carried an insulin (1ml) syringe and small vial for refilling. In other words, there are way too many cheap methods to keep your pens safe. Ah, yes! And I also have a small metallic Berkleys mints box that I use to protect a tiny weeny mini "Peggy" pen. Like their larger, standard sized Altoids or Berkleys boxes, they are great safe EDC carriers (that's where I keep nibs, and you can use their different colors to code contents). And for some, like others do, on a shirt or jeans pocket (love that with the Montblanc Noblesse) --so, draw off three points from my score! - when not at work (at home, out, shopping, ...) it used to be shirt pocket all the time. Untill a few weeks ago, taking some stuff up to the attic, raising the box unclipped a Lamy Vista from my shirt pocket. It dropped a few meters and broke. So now, when not at work, I'll have my brand new Kaweco BRASS sport in the pocket of my pants at all times. 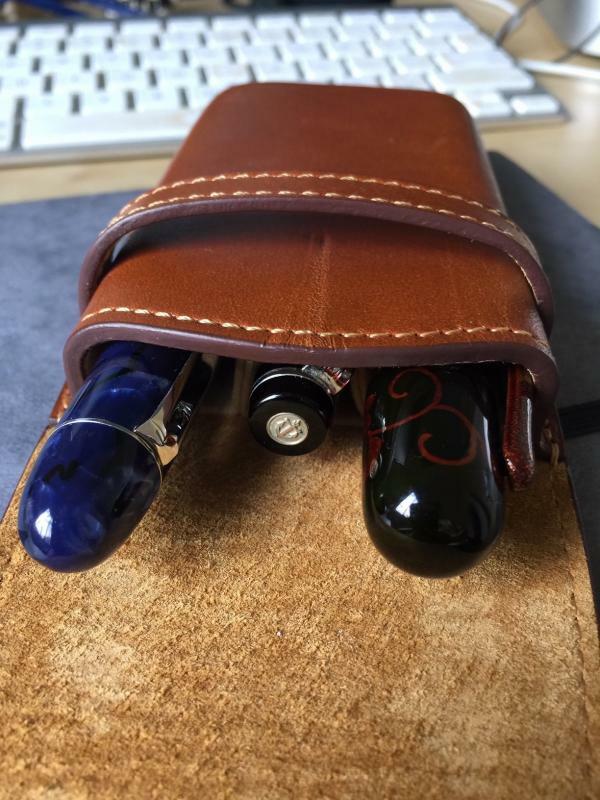 - For work, I carry the pens in a 3 pen leather pencase. Once at work or at the client, one of the pens will be at the desk while sitting and in my shirt pocket while moving around. Help With Vintage Flexible Fountain Pen Hunting!